If you enjoyed Tranformers Age Of Extinction over the past week since it's release last Friday, pre-orders for the blu ray are available at most major retailers right now. But for you collector's out there Amazon has an exclusive you may want to get your paws on. Here's the Transformers Age of Extinction gift set with Limited Edition Statue. 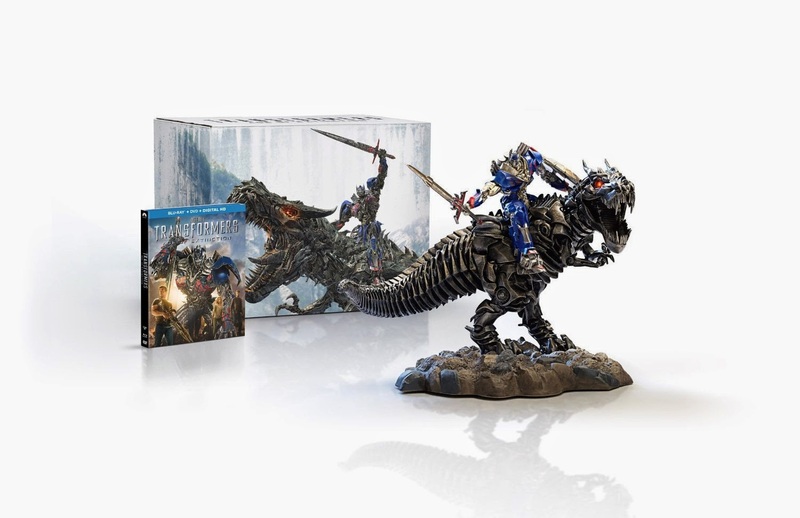 "Only at Amazon – Transformers: Age of Extinction Blu-Ray Combo Pack gift set includes a highly detailed collectible figure of Optimus Prime riding Grimlock. The Optimus and Grimlock figures have been crafted utilizing the very same digital models that brought the characters to life in the film. Every sculptural detail of Optimus and Grimlock has been perfectly captured and enhanced with hand-painting, from Optimus’ flame-detailed chest and forearms to Grimlock’s fiery, glowing eyes. Together, Optimus and Grimlock stand over 7.25 inches tall (display base height included), and Grimlock stretches approx. 9 inches from his toothy maw to tail tip. The Transfomers: Age of Extinction Optimus and Grimlock figure is a must-have for any Transformers fan, and is available only at Amazon." So if you're looking to add this to your collection, you can pre order the Amazon exclusive at a reduced price here.